One of the most unusual Famcamps We have stayed at. It is owned by the Navy but is on a golf course with public access, you check-in in a small unmarked office in the back of the Pro shop, the office is open 364 days a year. 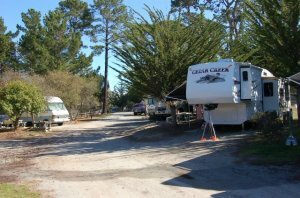 We had a nice site ($33/day) with a picnic table and grill on site, laundry $1.50 wash $1.00 dry. We didn't use the showers but they looked clean. There is a small grill open daily 7:30 to 4:00. The location is close to the wharf and the Aquarium, pricy but there is a veterans discount. The drive down the coast to the Hearst castle is well worth setting a day aside for, the castle is the closest thing to a real castle I have seen in the USA. Also, there is a large elephant seal colony (hundreds of seals) to stop and observe along the way.